Four days left in the final countdown of National Blog Posting Month, (Nablopomo). In the spirit of the holiday here’s a look at how classic Hollywood spent Thanksgiving. I’ll just bet Joan cooked this herself. Fun publicity still from Judy Garland and Mickey Rooney. Some holiday cheesecake from Marilyn. More Thanksgiving cheesecake, this time with Vera Ellen on point. 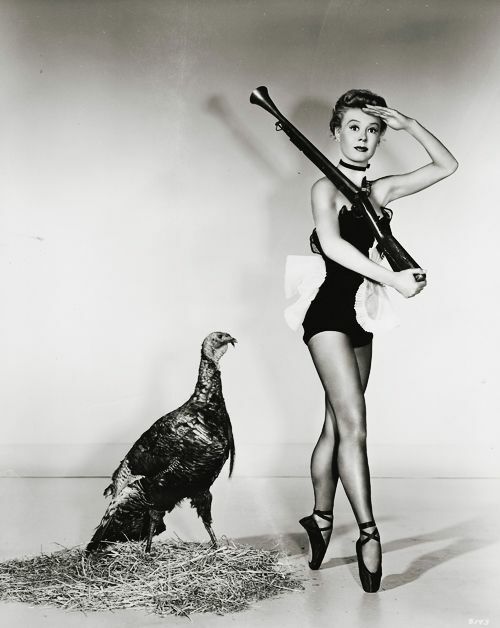 Esther Williams pardoning the MGM turkey. 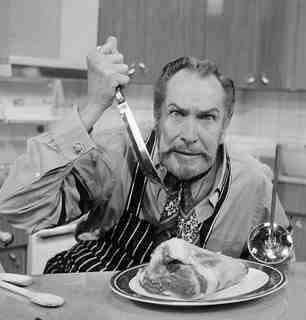 Vincent Price doing what he does best. And finally from one of my all time favorites, Bob Hope shows us how to carve a turkey. This article in Hollywood Magazine was to promote his upcoming move Thanks for the Memory. Of course the song Thanks for the Memory was originally from the movie The Big Broadcast of 1938 which was Hope’s breakout role. This second one must have been a quickie follow-up to capitalize on his sudden popularity. Madge is off to do some cooking so she will leave you with that classic song from Hope and Shirley Ross. Thank you for the memories Bob. See you tomorrow.